There is one catch though. Feeding your chickens mealworms all day can get expensive… very expensive. Fortunately you can grow your own mealworms for a fraction of the cost and provide your girls with healthy snacks all year round. Today we’re going to take a look at what exactly mealworms are and also how you too can grow your own mealworm farm. Note: An adult mealworm is known as the Darkling beetle. A female beetle will lay up to five hundred eggs during her short lifetime of a couple of months. After a couple of weeks, the eggs will hatch and become larvae – which we know as a mealworm. Its’ proper title is the yellow mealworm. Mealworms molt their exo-skeleton several times before they reach the pupa stage after approximately 3 months. It is possible to buy mealworm farm kits online, but it’s much cheaper and more fun to make your own! 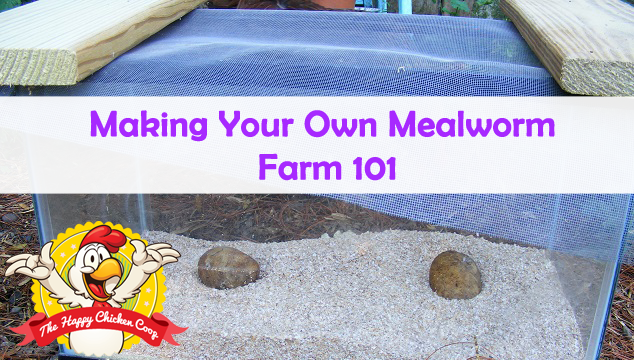 So here we go – have some fun and become a mealworm farmer. This is an excellent project for the kids – it’s easy, doesn’t require any high maintenance and isn’t labor intensive. It’s also a natural, self- replicating food source for your flock. Before you start your mealworm farm you will need to find a container which you will use to grow them in. 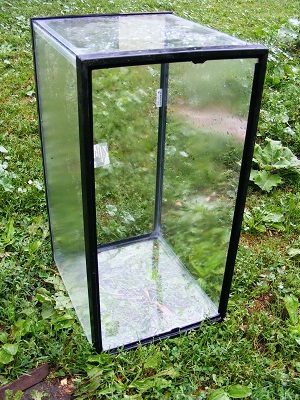 For the container itself any of the following will do: an old aquarium, plastic storage tote or similar item. If you use a fish tank, or glass sided container, you can watch your insects at work! It is oddly fascinating watching them go about their business. Between beetle watching and chicken watching, I can waste hours each day! Whichever container you choose make sure it is approximately: 12 inches x 24 inches and 12 inches deep. The chosen container will also need a lid or screen mesh to put over the top. The lid needs to allow for some air circulation through the container. I use an aquarium so that I can see what’s going on inside and get a feel for how quickly they are developing. Now you have found an ideal container you need to make sure it is thoroughly clean and dry. At this point you also need to find an ideal location for your container. My mealworms are kept upstairs in the barn which is dark and gloomy. Any location you do choose needs to be a warm (the ideal temperature is 80F), low light/ dark environment. If you aren’t squeamish, the closet would be fine. As winter nears, I will be investing in a heat mat specifically made for reptiles. It has a programmable thermostat and comes pre-wired. This will keep my mealworm farm at 80F all winter long! If you are lucky enough to live in a warm climate year round, you probably would not need this. However, do remember to keep them in a dark place. Once you have your container and it’s in an ideal location you need to fill it up with feed (substrate) for the mealworms. The exact amount you will need depends on the size of your container; it needs to be about 2-3 inches deep. For the feed you want to use wheat bran. If you can’t use wheat bran then rolled oats, chicken mash or cereal crumbs will also work. Note: If you use chicken feed make sure it doesn’t container diatomaceous earth as this will kill the mealworms. 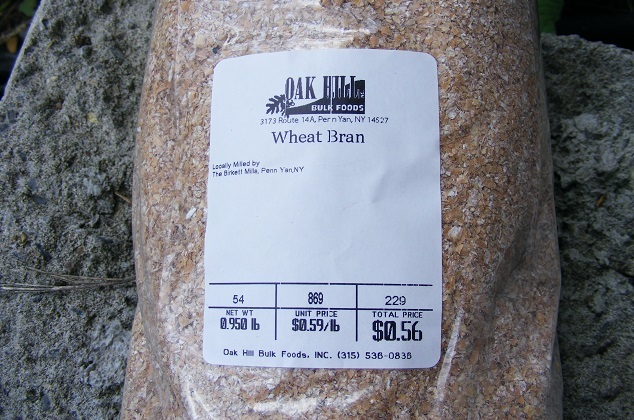 You should be able to buy the wheat bran for less than $1 per lb. Whichever feed you decide to use make sure you sterilize it prior to using- this will ensure that no pests are present. To sterilize, spread it out on a cookie tray and bake in the oven for 20 minutes at 130-150F. After you have sterilized your feed put 3 inches of it into your container. 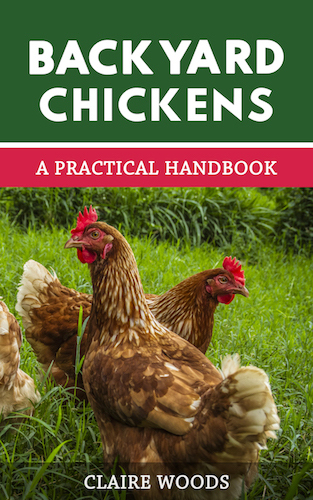 It is important to know what the mealworms have been fed since they can indirectly impact your chickens’ health and by extension – yours. Also the possibility of zoonotic disease such as salmonella cannot be ruled out since the exact diet of the insect is unknown and the conditions in which the beetles are kept may be less than clean. So for this reason I would only buy my mealworms from a reputable local source that I trust. Don’t import them cheap online- you don’t know what they’ve been fed. Note: Do not buy giant mealworms. It is possible they have been treated with a growth hormone that will inhibit pupation and produce sterile beetles. Once you have purchased your mealworms, gently poor them out into your container and apply your cover to the container – the cover is to keep things out rather than the insects in. Mealworms are a favorite food of reptiles and amphibians, so you really don’t want your pet iguana eating all your worms! If you want a hands off approach just make sure you feed them every couple of weeks to maintain the feed depth of around 3 inches. Now you just need to wait and let them flourish! I find the easiest way to collect the worms is to add new food to the farm. You can use a vegetable such as a carrot and place it into your container and leave it for 5 minutes or so. The worms (larvae) will latch onto the carrot, pull the carrot out and shake it over another empty container and you will have lots of mealworms to feed your chickens with! If you are lucky and happen to suffer from an overabundance of mealworms they can be stored in the freezer in plastic bags. Note: Remember to use gloves to handle the mealworm farm and a few people use masks when working with the tank because of the dust. Some people become allergic to the fine dust created by the beetles, so if you already have a medical issue with your breathing, please err on the side of caution and wear a mask or respirator. An old aquarium, plastic storage tote or similar item will do. Make sure it is approximately: 12 inches x 24 inches and 12 inches deep. Thoroughly clean and dry your container. I use an aquarium so that I can see what’s going on inside. Also make sure to keep your farm in a warm, low light/ dark environment. Add your substrate – wheat bran, rolled oats, whatever you have chosen. Spread to a depth of 2-3 inches. Add mealworms, dump them in gently. You can buy mealworms either online or at a local pet store. The substrate will need to be topped up once in a while to maintain a depth of 2-3 inches. Don’t worry about removing dead beetles, the larvae will do that for you. Now it’s time to reap the rewards. Collect your mealworms and feed your chickens! Enjoy your project! 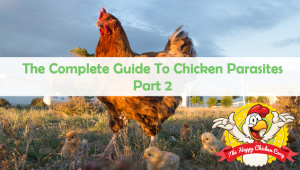 The satisfaction of raising your own chicken treats will add to the satisfaction of saving money and knowing where your hens’ treats come from! Are you going to try and grow your own mealworm farm? Let us know how you get on in the comments below. I love this. they are so yummy! Instead of putting your extra mealworms in the freezer can you just start a new colony? Yes, you can started another colony if you want even more worms! Just bought everything we need to get started. Our chickens love mealworms and i was spending a fortune! Hopefully they produce fast! Do you know if the worm farm attracts other bugs? Like scorpions we live in the desert. Fantastic, let us know how you get on! It’s shouldn’t do providing you keep it hygienic and well contained. This seems very simple. I was reading a DIY earlier that said you have to keep beetle, pupae, work away from each other. Have an egg, nursery etc. etc. Seemed overly complex. Thank you for this! Nope, you don’t have to separate out the pupae and beetles. The simpler the better- that’s what I say Mike! Thank you so much for making what was becoming a laborious, thankless task sooooo much easier! I’ve been ‘farming’ since May & just as I was about to clear my beetles out, I thought I’d check to see if I could find a simpler option – and found it!! Massive thumbs up & thank you! (Have a generous amount of 2nd gen baby mealies, too, so the whole process has only taken 3 months! So happy to hear we’ve kept your chickens in supply of mealworms! If we have an over abundance of mealworms can we freeze them and grind them into meal and make pellets out of it? It might be simplified, but very inefficient. All stages (except egg) of the life cycle of mealworms are cannibalistic. If you do not separate them, your production will suffer. I have done it both ways…now I separate them. It is worth the extra work. Interestingly, is it much extra work running separate ‘farms’? Separate them how? By stages? Hi! If I am using those plastic storage container drawers to build a mealworm farm, does it matter if I use the 8″x15″ ones? Or will it only really work with the larger, 15″x19″ drawers? Thanks! Nope, it will still work perfectly fine in a smaller container. Just make sure to reduce the amount of feed and meal worms you put into the container. If you take a 2 liter tub (like a large yogurt pail) and drill a bunch of 1/4 inch holes in it, you can filter half the colony through it and strain out many of the large larvae, pupae, and beetles to give to the girls. What passes through with the uneaten food are eggs and early larval forms; these will grow into late larvae in a few weeks. If you want, you can start a new colony with a dozen beetles. Hi, Thank you for your useful information. How many mealworms are enough for each hen? We normally give our hens mealworms once a week- it’s normally a large handful per 6 hens. What about cleaning the container? Don’t you have to empty and clean it occasionally? And if you sterilize their food, don’t they need a water source? And finally, what about their, ahem.. castings? Thanks for your very informative site! I normally clean out the container when I’m starting a new colony. Nope they get all their water from the grain which you will feed them! if your using a heat mat can that go under the tank or must it be in the tank? im thinking if its outside the tank it will be easier to keep clean and will stop the worms climbing up the wire and out the tank! One of those seed starting mats would work good for this…you set the trays (In this case your worm container) right down on top of it. Perfect! just started raising chickens and i spend a bunch on meal worms, want to start a farm asap. I have everything to start except the worms, would a place like tractor supply have them. Yes they sell them- enjoy your farm! The worms are also used for fishing bait. So a fishing store may have meal worms. I found a local breederr on fb. Is it possible you can send us an email with photos and we will see if we can identify them! I have had my meal worms for about a year and there is a lot of fine dust (castings) at the bottom of the bucket. How does one get rid of this without losing eggs, small meal worms etc? When a large amount of fine dust piles up I normally transfer them into a new bucket/container. Unfortunately I always tend to loose the small eggs when doing this, so I too would be interested to hear if anyone knows how to do this without loosing the eggs? I haven’t tried this, but what if you transferred the adults and pupa to the new container and then collected the mealworms every day, or even several times a day from the old container until production slowed down significantly. The old container wouldn’t have any adults adding more eggs and the eggs would hatch and you would get lots of mealworms that you can put in the fridge to use while you are waiting on the new batch to produce. Alternatively you can start a new colony, keep the old colony going as usual until the new one was up to good production then harvest everything you can and toss the old one. You will still lose some, but you will not have lower production. thanks that IS a good idea. I been trying for years to farm but now I know what was wrong. Saw the beatles but not new worms because I was cleaning the batch and sift out the dust losing the eggs. If one wants to save the eggs in the frass (castings) just put some substrate, whatever you use in a dish tub or the like ….then leave it be in a month give or take you should have mealworms from any eggs in what is often tossed out! I saved the waste also just in case. Sure enough there were baby worms. Hi! Good stuff here….my question is this…I just purchase a container of 500 worms. They said put them in the fridge and warm them up to room temp to feed to the hens. Can I start a farm with these that came from the feed store??? Or are there certain ones you need to start with?? You can start them with worms from the feed store yes. Hello! So you start with dried meal worms? the ones in bags on the shelf (dried) will not work they are dead. I have NEVER seen live mealworms in any of our local feed stores…. pet stores yes, but they are far more expensive than finding a breeder who sells them, but as long as they aren’t ‘superworms’ or giant meal worms… its all good. I buy from an online supplier. They get shipped live. I do tell him to have post office hold for me. That way they are not sitting on the door step in crazy Ohio weather. The meal worms for sale in pet stores SHOULD be kept refrigerated so you don’t see them on show for sale! You need to enquire! It sounds to me like these are the giant ones… However, there is nothing to stop you trying with them and seeing if you get eggs. I buy dried mealworms and give my four layers 2 handfulls everyday which equates to $30/month. 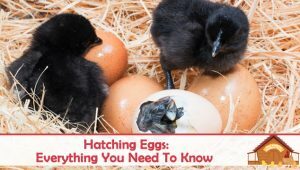 Getting 3-4 eggs per day. They love em and i enjoy feeding them cause i belt out the star wars anthem like a chicken. They go nuts as soon as they hear it. Is there such a thing as to many mealworms and if i start a large worm farm can i dehydrate them? Thank you for your input. Hi, I have been farming mealworms for my quail and chickens for 2 years now. I have my beetles in their own box where they lay their eggs. Every 3-4 weeks i remove the beetles to a new box.and leave the eggs to grow. This way I know there will be no eggs in the frass on the bottom and all the mealworms are the same size. Easy to empty one box and start over. Has anyone tried to dry mealworms themselves? I tried and it didn’t go so well. I fried them instead of drying. Don’t think I have the stomach to try them !! Please forgive me as I am completely new. So, some of the mealworms grow into beetles and you take the live beetles and move them into a seperate container. They lay eggs and then you move them again? Can you dump the new eggs into the first container? I am so going to do this, thank you for such a well written and simple instruction. I had read about separating, sifting etc., and thought that maybe it was too much trouble but clearly it doesn’t have to be. One question – do the beetles fly?? I don’t have chickens, but I want to start a mealworms farm for my 2 leopard geckos. It has been getting expensive and tiring to have to go to the pet store for more worms all the time. I am going to have to try this! It sound so simple! Thank you! Hey, just wandering, about how many worms would you get and in what time frame? I am trying to get some new chickens and am thinking about using meal worms. If they are already getting different supplements would it still be ok if they got meal worms about once a week? I’ve been farming mealworms for over a decade now and this is what has worked for me as well as some of my friends who also farm mealies….First, I want to let everyone know about the dangers of mold. If you see any mold in your farm- TOSS IT! I’m not joking, throw out the entire farm and start over again! Once your farm has been contaminated with mold, you are risking the lives of whatever pet you’re feeding the mealies to. In the 13yrs I’ve been farming mealies, I’ve only ended up having to start over once. This is because I learned my lesson the first time it happened, and I was extra careful after that. Even if you think you’ve taken all the mold out, there could still be unseen particles left in your farm. You also don’t know what beetles or mealies have eaten the mold, so the safest thing to do is to throw out everything, ,thoroughly clean your containers, and start over, being extra careful with whatever water source you’re using (carrots, potatos, or water gel). Thank you for the advice Brandi! So, if I keep them inside (for the heat) is there any risk of the beetles escaping, infesting my home, and causing an insect problem? I’m thinking roaches here and probably shouldn’t be. LOL! Just wanted to know what happens to all the mealworm waste. Do you need to clean the container completely every so often? If so, how and how often? Also, I understand that mealworms are consumed in a lot of the Asian countries. If I wanted to consume them what would they need to be fed do you starve them before harvesting to eliminate as much of their waste before harvesting? Thanks in advance for your expertise on this. I buy mealworms at our local bird store and feed them to my bluebirds. At $13.00 per thousand, it is getting expensive, so I will be making a mealworm farm soon. Thank you for this wonderful tutorial!! I tried to skim through most of the comments here. You don’t have to feed them anything beside the bran? I thought I read to give them kitchen scraps to eat, specifically veggies with a higher water content. Is there any value in that? 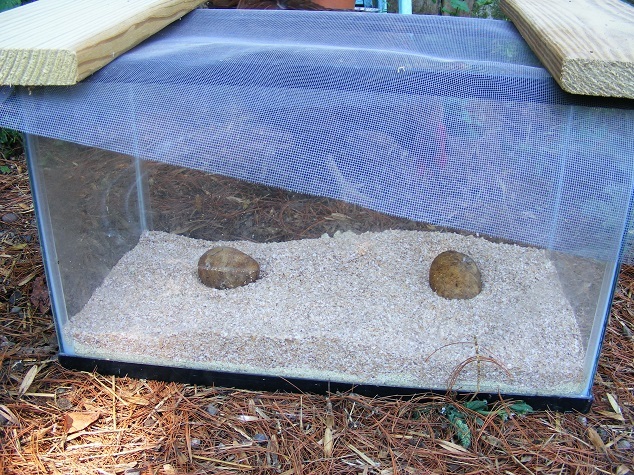 Or should I just feed them a potato when I want to collect them and that should be sufficient? Great information. I’m starting a mealworm Farm because I can’t find any mealworms that don’t come from China. And I trust China like well you know. Who knows what they feed them over there. My chickens love the dried mealworms I get at a local feed store but want to give them more protein since I am not able to free range them. I am definately make my own farm. Thanks for the detailed instructions. Easy to follow. Sounds like maybe they were molting? insect shells don’t grow so they split and slough off. Or maybe a beetle hatched and ate them. The larvae will also consume one another sometimes. I actually raise mealworms for my herps (I raise reptiles and inverts), and this really seemed to work. I used a 20 gallon I had sitting around and my farm has been running for three or four months now just fine. I am going to raise mealworms on my own. I have so much different information about raising mealworms on your own. I have plastic containers with lids that are 16 1/4 inches L X 11 1/4 inches W x 6 3/4 H. I have about 200 mealworms that I had to buy at THAT FISH PLACE in Lancaster County. I put OATMEAL oats in for bedding. I FEED THEM CARROTS, potatoes, celery,apples. I need to feed a feeder for them yet because I am going to feed them to the blue birds. is there anything else I need to do ? Thank you for making this so simple, reading this actually encouraged me to start my mealworm Farm. The only suggestion I would make is to add that you need to put potatoes or carrots or some low moisture vegetable in the farm for the moisture and food. Thankfully I ran across another article that told me to do this just as I was wondering about three days in how they obtain moisture. Again great article thanks so much. I have made my own mealworm farm this morning and am now waiting for them to be ready to be treats for our girls. 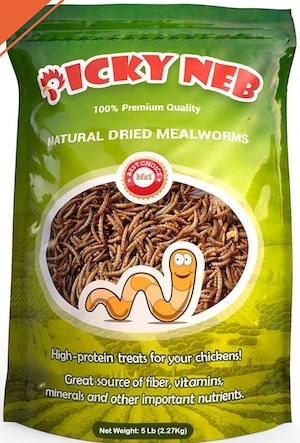 Can we just feed the live mealworm to the hens, up until now we have been buying meal worm which I obviously not live…? Do the worms climb up the tub ? Do I need a lid with holes in it or can I do without the lid ? Thanks ! I have the worms in the prepared container and still wanted to check in with how often to give them a vegetable? Also, why only leave it in for 5 minutes (to avoid mold? should I chop up the vegetable or put in whole? I just started and am hoping in 2 months my girls will get weekly treats from this project! Call me dumb, but I have always bought dried worms to feed my Chickens, Turkeys and Guineas which is very costly and I am so pumped and ready to try this. As I am a newbie, I am confused about feeding them vegetables. Do I need to feed them vegetables as a water source or just to aid in collecting them? I dont want to chance mold production unnecessarily. Thanks soooo much for this awe inspiring article! !